Holy Batman, Batman! This week is chock full of the Dark Knight including Scott Snyder's final issue of 'All-Star Batman' #14, Selina's answer to Bruce's engagement in 'Batman' #32, the origin of dark multiverse Bruce Wayne Green Lantern in 'Batman: The Dawnbreaker', & the debut of Sean Murphy's "elseworld-insipired" 'Batman: White Knight' #1. 'Green Arrow' #32 finished up the Gotham Resistance tie-in to "Dark Nights: Metal" and 'Avengers' #672 kicked off the latest batch of storylines tying into "Marvel Legacy". You can find this week's must reads down below in the pull list highlighted in GREEN! After a few months of waiting, we finally know the answer to Bruce's proposal to Selina. For those of you that haven't been reading, writer Tom King has been using Bruce's proposal as a reason him to recount the "War of Jokes & Riddles" to her so that she knows his darkest secret. The Joker and Riddler have been at war with one another, each recruiting various villains from Batman's rogues gallery to aid them. While an event that you would think would be over the top crazy, it never quite reaches its epic-ness that its name implies. 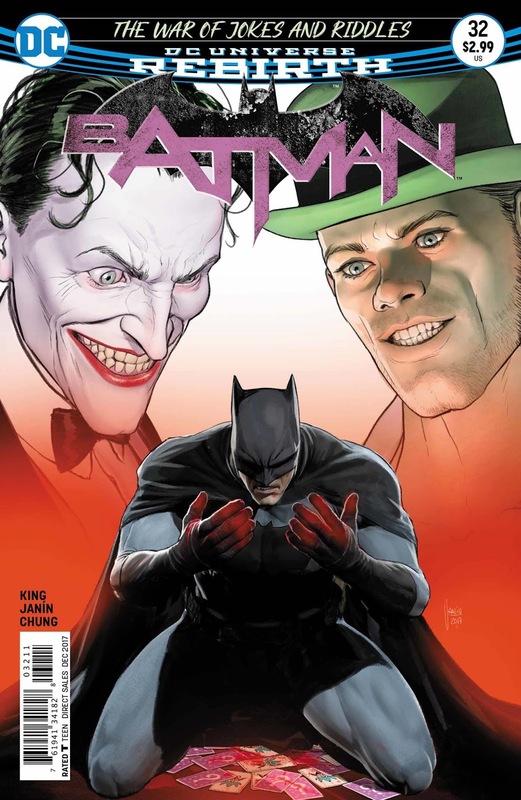 In this final issue, Batman comes face-to-face with both Riddler and Joker and eventually comes to the conclusion that he needs to take out the Riddler and he tries to stab him in the face. The Joker puts his hand up, stopping the knife, because he thinks it's a big joke and finally finds his laughter again. The biggest issue here, is that you don't really feel that Batman has been pushed to the point of trying to kill the Riddler. While this is earlier in his career, it seems like Bats would have been able to come up with another solution. So...back to Catwoman. After hearing Bruce's story she asks him to ask her again to marry him. After which, she finally says "yes" and the issue ends. It will be interesting to see what a dynamic looks like with Batman and Catwoman engaged. Will she agree to go completely crime-free? Will they actually end up getting married? What will ultimately end up driving them apart? I guess we'll have to wait and see.